Holly has gotten into a blogging rut. She’s still writing almost every week. But man …. blogging makes her feel so bored. She plows through her first drafts. She drags herself through editing. Even hitting “publish” leaves her cold. Where has the excitement gone? Every week, she wonders whether her readers sense her boredom. And sometimes, she asks herself whether she should write something different. Could she experiment with storytelling? Could she try a metaphor? Could she write about something totally different for once, something she’d love to write about? Holly thinks back of the time she was young. She loved writing. She dreamed of publishing a novel. But those dreams evaporated when she grew up. She needs to make a living, and experimentation with her writing takes time. Time feels too precious. Is there a business benefit to creative writing? People who are successful in these roles are a lot more strategic and less creative. She suggests good HubSpot editors spend most of their time optimizing promotion and improving existing content. I know I probably pour too much energy into writing rather than promoting. But really, is creativity not valued anymore? Metrics and measurement are important. But the art in marketing is just as important as the science! Of course, it’s not surprising HubSpot is less keen on creative experimentation. They’ve written so many blog posts already. A Google search for any page on blog.hubspot.com generates a whopping 16,900 results. This is an estimate of the number of blog posts HubSpot has published. But you and I are not like HubSpot. We can never produce so many articles. If HubSpot were the McDonalds of business blogging with a streamlined content production process, we are the artisan chefs running tiny restaurants. People come to our restaurant for the food as well as the atmosphere. We produce valuable content. But we attract readers because they like us, love us, and appreciate who we are. For you and me, the best way to attract a loyal audience is to nurture our voice and to stand out. So, we need to be creative. To be creative without sacrificing productivity, we have to find our own sweet spot between chasing productivity and welcoming creativity, between order and chaos, between strict planning and freewheeling. Between staying safe and exploring new territory. Start by setting boundaries for your creativity. Have you ever sat down to write, and discovered you had no ideas? You rack your brain for inspiration, but can’t dream up a single good idea? So, instead of looking for a random idea, limit your idea generation to a specific topic. For instance, as a life coach, ask yourself: What’s the main aim of your clients? Perhaps they want to find more balance in their lives and feel less stressed. So, how can you help them achieve that? If you give yourself 20 minutes, you can probably come up with another 20 to 40 ideas. Not all ideas will be good, but you’ll surprise yourself by how many good ideas you’ll dream up. Enough for a few months of blog writing. Want to come up with a creative metaphor? You can set a timer, too, and limit yourself to metaphors from one specific field, e.g., cooking or sports. You may find you can’t come up with a metaphor in one session. That’s normal. Let it go, and see whether your brain comes up with an idea when you go for a walk, empty the dishwasher, or when you shower tomorrow. When we allow ideas to percolate, our brain keeps working in the “diffused thinking mode.” And especially in that mode, our brain can make new connections—even if we’re not aware of it. And making those new connections is key to creativity. I used to think “going down rabbit holes” was a bad thing. Aren’t we supposed to stay on task to get our work done? When you’re in productive mode, you need to stay on task. So, for instance, instead of looking for a quote while writing your first draft, write down “TK” (to come) and keep writing. Look up that quote later. In contrast, when you’re in creative mode, allow serendipity to guide you, go down rabbit holes, and follow your curiosity. When you follow your curiosity and read widely, you can find inspiration everywhere. Look for connections with your core topic. For instance, when reading Hemingway, I wondered … what can business readers learn from this novelist’s writing style? And when I read a book about curiosity, I wondered how writers can use curiosity to boost click through rates. The top scientists switched topics frequently. Over the course of their first hundred published papers, [they] switched topics an average of 43 times. So, to kindle your curiosity, stop reading books from those ubiquitous lists with “must reads”. Instead, follow your own curiosity and read what excites you. Life is too short to read books that bore you. Don’t kill your own curiosity. You can also foster creativity by asking “Why” more often. Why do clients struggle with a specific problem? Why do they make certain mistakes? Why does A work, and B doesn’t? Why did a specific project yield great results? Why can’t you change xyz? He never outgrew the child’s need not just to admire the beauty of a blue sky but to ask why it is that color. Rabbit holes are only dangerous when you don’t limit your time. Or when you spend time on social media as an excuse for not writing. If you know what your aim is, you can choose to be intensely focused on a task or surprise yourself with new ideas. I have two desks in my office—one is “analog” and one is “digital.” The analog desk has nothing but markers, pens, pencils, paper, index cards, and newspaper. (…) This where most of my work is born (…). The digital desk has my laptop, my monitor, my scanner, and my drawing tablet. This is where I edit and publish my work. I don’t have the luxury of two desks. But when generating ideas or outlining, I trigger my creative mindset by using colored pens and paper. In contrast, when I’m in production mode, I use my computer. In his notebooks, Leonardo set out his simple method for truly observing a scene: Look separately at each detail. He compared it to looking at the page of a book. It was meaningless when taken in as a whole and had to be examined word by word. Too often, blog posts barely scratch the surface of a topic. They give generic tips on improving your writing skills, or how to become a successful entrepreneur. Do you think anyone could learn that from reading one blog post? Do you think that helps bloggers build authority? The magic in business writing appears when you learn to listen better to your customers, when you dig deeper into your topic, when you force yourself to learn more. For instance, have you written a list post with 10 tips? Great! Now, try to write a more in-depth post about each of these tips. 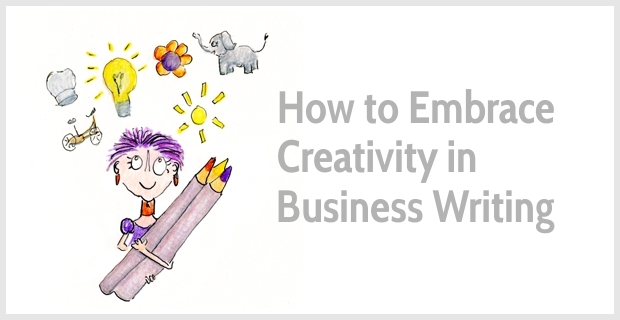 Injecting more creativity into your writing doesn’t require a lot of extra work or extra time. But you have to allow for a limited dose of chaos in your process, to foster curiosity, to formulate questions and look for answers, to admit your ignorance, to be brave enough to explore unfamiliar territory. When you play and learn, you enrich your life. Writing becomes more fun, you procrastinate less and boost your productivity. I was curious throughout what you’ll suggest. I love that you show creativity not a matter of time but that of ‘how’ we approach our work. Thanks, Henneke! Enjoyed reading. I love how you always bring the balance back, especially for those of us who run our own businesses. We can’t be HubSpot, and our voice will come from nurturing creative room, which in turn will be fed from our unique collection of interests and passions…not from a treadmill. It’s so easy to get side-tracked and think we have to do everything the “big boys” are doing, but it’s impossible, so we have to do what we’re good at and be ourselves. We also don’t need as big an audience as they have! I am definitely more creative in analog mode. Truth. I’ve known that for years. Now to extricate myself from under this laptop! Thanks for an essay I loved! I used to receive a clothing catalog with creative descriptions for each product offered. For a blue jumper with a large apple appliqué, the description was NOT: Corduroy jumper, in blue, side button closure. Nope! The writing was adorable, instead: Be the apple of everyone’s eye with red bling introducing you to the world. Toasty corduroy for the first frost season and the lover of true quality, in deepest midnight blue. Not only did I long for almost every item on its pages, but also, I kept those catalogs and amused myself reading them, page by page, chuckling at the creativity. It was more than liking the catalog, though; it was appreciating the company, itself. You’ve given me new inspiration, again, Henneke! I love your example of the clothing catalog. J Peterman has also wonderful product descriptions, often like mini-stories, and they’re full of personality. You’d buy more than just a piece of clothing. Thank you for your lovely compliment, Katharine. Happy writing! I love “Steal Like an Artist.” I found the idea that creative work always builds on what came before very liberating. I read it a few years ago, but recommend it in my blogging course. It’s funny how moving to a different place can reignite our creativity, isn’t it? I sometimes wonder whether that’s because we start associating the initial place with procrastination and feeling stuck. Or would it simply be that getting up and moving gets us unstuck? Whatever it is, it’s worked for me, too. Wow! What a great metaphor comparing McDonald’s and Hubspot with small businesses and gourmet restaurants. It gives us small business bloggers inspiration and a reminder to find joy in our own work instead of worrying about how to mass produce blogs. As always your posts are filled with enjoyable and engaging content sprinkled with concrete suggestions that can be incorporated into any ones work process easily. Thank you for your lovely comment, Nancy. You have an uncanny habit of getting inside my head and rattling the cage. Thank You!!! I love the idea of having an ‘analog’ process for creativity and a ‘digital’ process for production. I might have to give that a go! Yes, try it. I’d love to hear how you get on. I’ve read that it can be a few weeks before a “trigger” starts working and a new habit is consolidated. I’d highly recommend both “Steal Like an Artist” by Austin Kleon and “Messy: How to Be Creative and Resilient in a Tidy-Minded World” by Tim Harford. Both give an interesting perspective on creativity. Thank you for stopping by, Kate. Happy reading! Thank you for a thought-provoking and inspiring article. I’m now thinking about how I approach my creativity. Writing this article also made me think about how important creativity is for me, and what I can do to keep my creative spark going. Thank you for stopping by, Rob. Happy writing! We are the artisan chefs of our own restaurant not line cooks in fast food joints. Love that distinction, Henneke. Not that there’s anything wrong with being a line cook, but trying write like a line cook will not get our blog noticed. Thanks for the great tips on tapping into the infinite source of creativity. Yes, you make a good point – there’s no a problem with being a line cook (great phrase, I didn’t know it), but you don’t want to put a line cook into a tiny artisan kitchen. Somehow, we know most of these things. At some level we do. Then, the number game, the ” productivity” myth and the sheer noise that surrounds us, seems to prevail and bring us back to square one. But our best ideas, always come to us when we have limitations or when we stop looking for them, while we’re hanging our clothes, for instance. Wow. What a lovely comment, Elfin. I’m planning to start sending monthly (?) emails with links to recent and “classic” blog posts, so I’ll make sure this one comes around again as a reminder. And yes, I find the chasing of productivity tiring, and I often wonder whether it’s counterproductive. The constraints work for me in the colder months of the year, but I do find it hard to stay on task on warm sunny days. I have given myself permission to play more than in the past. Because life is indeed short. And, I’m fortunate that I won’t starve if I don’t get that article done. When I play, I’m happy and then the creativity really does shine. Interesting how you find it easier to stay on task in the colder months – I guess the sunshine begs you to go outside! Basically I read that article grinning, nodding wildly, giggling to myself and occasionally blurting aloud, ‘Yes!’ Thank you for that wonderful experience! I’m happy to inform you that this post is featured in the recent part of TimeCamp’s weekly Productivity Articles roundup! Wow haha hey there Henneke! You never fail to disappoint! Reading about Howard again was a real blast to the past! Along with writing while feeling groggy, I actually completely forgot about the bridge-to-the-past (*gasps in horror*). Cheers for bringing that trick back to my memory! Anyways haha, we’re talking about THIS awesome blog right, so let me just say it again… WOW, you really don’t disappoint! I love your idea of limiting the generation of ideas to a specific topic! It’s actually such an awesome bit of advice that I think everybody does at one point or another.. But you putting it into words makes it VERY clear and powerful, and for me at least, helps get the idea to sink into my mind! OH AND ALSO: “For instance, have you written a list post with 10 tips? Great! Now, try to write a more in-depth post about each of these tips.” I absolutely LOVE this! I think that often when I publish articles that are based around lists, it’s usually when I’m not feeling at my best level of writing, and it usually shows a bit because it could feel rushed or maybe not as informative as it could be. So your advice of going back and talking more ’bout each of those tips is just GENIUS! Every single dot point could potentially be a separate article/blogpost, with paragraphs atop paragraphs of information, stats, studies and elaboration! So YEAHH I reckon that for anybody (definitely for me) that might not know what to write, they should definitely go back to one of their list-type posts and just start going in-depth about the points in said posts! Haha but yeah, from hearing about how poor Holly’s childhood dreams and excitement for writing evaporating because of reality, to allowing doses of chaos into our writing processes to add that passion, excitement and that genuine spontaneity….. It was a lovely 10 minutes of reading. Thank you for your hard work and all the hours you must’ve put in to give all of us these awesome stories/life lessons! I’m glad you enjoyed Holly’s story and this blog post, George. Thank you for stopping by, and happy blog writing! Thank you for stopping by, Max. I think I will need this approach in dedicating most of my scarce time in promoting my contents rather than just spending lots of hours producing contents. Yes, promotion is important—especially if you feel your audience isn’t big enough yet (or if, like HubSpot, you have so much content that producing more makes less sense). I am totally hooked. Period. My fins are pumping and I have begun pushing upstream. Thank you, Henneke.